There is a good gauge for fitness behind our house. It's about a two mile climb, and it is a hard run. It's steep, works the legs, and keeps the lungs moving to the max. After doing some quick calculations, I figured out I'm a little slower right now than I was last year right before ski season. About a minute slower over 13 minutes…not insignificant. I've certainly had some breathing and general fatigue issues since Norway and then getting sick, but I do feel like those are subsiding, and if this pulled tooth ever starts feeling better I think I'll start making nice headway. Today's time was 13:06. I'd like to see if I can chop that down to 12 minutes before snow flies. And if possible, even a little faster. I have a few limiters right now. First, I don't feel like my leg strength is where it should be. So it's time to start doing two minute tucks (eventually more) and lunges at work. Hiking with weight will help too. Second, I have done basically zero intervals, save for the frenzied jumps that Adam has us do at roller ski practice. I think I've been a little afraid of running this summer – probably because of the breathing issues – but it's time to get over that and start improving. Fear leads to stagnation. One thing I realized today…I like running uphill and I'm decent at it. If I take a little identity with that, it's not the worst thing in the world. Sometime identity is important, and I have not had a ton of it lately. I have not been the strongest mentally this summer either. I worry too much. I've been a little bit prone to that since dad died. Worried about health, the future, getting older. Don't worry so much. What happens in life is beyond your control. You are still very healthy and young with a lot of good years ahead of you. I eat well, exercise religiously and am getting better with sleep. Don't let work cause too much stress…it's simply not worth it. Stay positive and have fun…life is too short for anything else. It was many years ago when coach Tim Davis made me say ten times on that hillside in Whistler, "I'm a good skier, I'm a good person." Keep doing that. You are a good skier (and runner, hiker, biker and everything else) and you are a great person. And I've got my dad at my side and the best wife in the world. Enjoy it…life is grand and the best is yet to come! On the technical side of things, Mal cautioned against Mule kick while roller skiing. 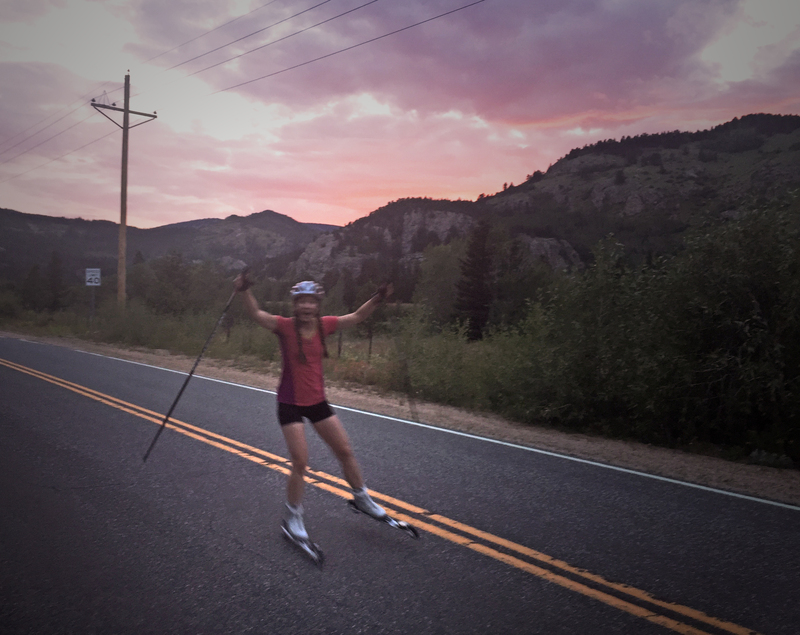 I don't think I'm doing it, but it's a good reminder to drive the knee forward, compress aggressively at the start of the stride, and stay dynamic and centered over the skis. Bottom line…it's almost August. It's time to get serious. Just think…in one month the leaves will have started turning. In two months, we'll be in the peak of foliage. And in three months, the trees will be bare and the ground starting to freeze. And in four months, we'll be skiing. It's been a hot summer in Boulder. Too hot really. The mountains are the place to be, and I hope the crispness returns to the air tomorrow morning. I saw the Ouzel that woman was telling me about last night! I was sitting on the rock, petting Stella, and there it was, hovering over the rapids, diving its beak into the water sporadically in search of food (I'm assuming). And then, it flew over to our side, before rocketing up the stream, just over the rapids, like a missile in flight. I didn't see the nest, but I'll have to look more carefully next time!